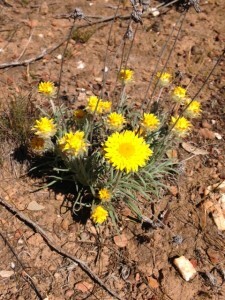 A warm spring day greeted participants and presenters at Connecting Country’s seventh workshop of the year, this time at the Yandoit bush property of Beth and Rick Higgins. The property is stunning for its early settler history evidenced by the numerous ruins seen as we traveled in, and also for the pioneering conservation areas that the Higgins began to fence in the early 1990s. 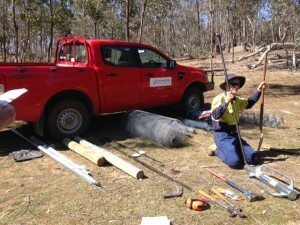 The topic of Conservation Fencing was addressed in depth by our three presenters for the day: Alex Schipperen (Connecting Country’s Works Crew Team Leader), Judy Crocker (Landcare Facilitator for the Mid-Loddon Landcare Network), and Paul Foreman, (Ecologist with Blue Devil Consulting). The Higgins property offered a diverse experience of exclusion fencing. Standing side by side, the first three exclosure plots offered an immediate comparison in terms of their presentation, success and challenges. 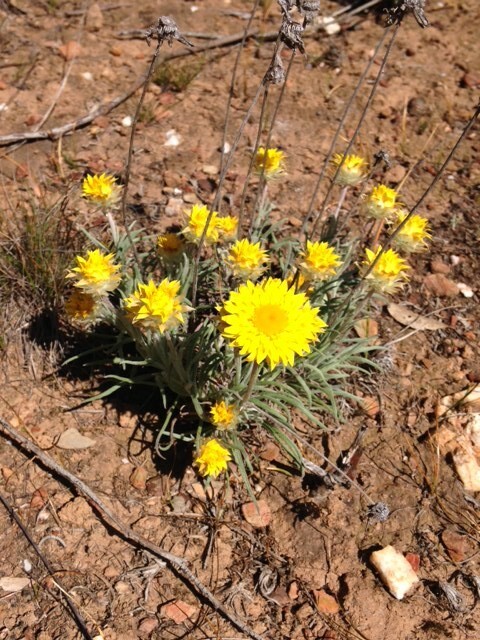 Initially direct seeded and tubestocked, the native acacia’s in the first plot were magnificent for their size and blossoms, while underfoot were masses of Lomandra and Hoary Sunray. The second plot was a riot of exotic grasses – including Yorkshire Fog and Phalaris – while the third plot was dominated by Kangaroo Grass, with other herbaceous natives struggling to appear above the dense tussocks. These three plots raised lots of questions about location, setting goals, how to manage them in terms of vegetation and fencing styles. 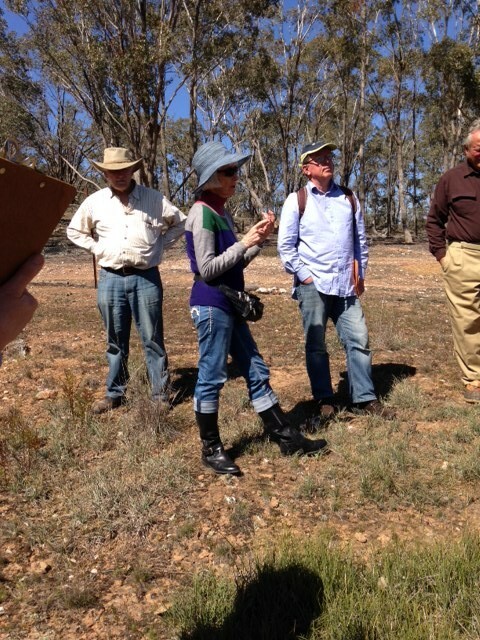 We also discussed how to manage with plots where nearly all grazing pressure has been removed. Paul considers a landscape approach to conservation fencing. Paul Foreman had participants considering location, geology, aspect, and the land’s past use – with a focus on walking the land rather than relying solely on internet-based vegetation mapping and data. The Higgins site, for example, is mapped as being Heathy Dry Forest EVC (Ecological Vegetation Class), whereas the actual vegetation on the slopes and valley would more likely have been open woodland. 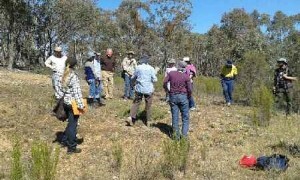 The goals for any proposed exclosure plot will vary from landholder to landholder and may be focused on preserving remnant vegetation, revegetation, or leaving alone for a period of time to see what appears naturally. Paul asked us to think about some of the management challenges when grazing pressures are removed. 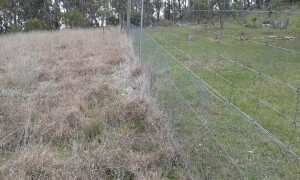 Crash grazing, control burning or herbicide may be necessary to reduce biomass such as the kangaroo grass in plot two. Judy Crocker was generous in the resources she provided participants, and in sharing her knowledge and experience in the Bush Stone-curlew habitat project and general land conservation west of Bendigo. Judy’s group has established five predator and herbivore proof habitat sites ranging from 4 to 8 ha to provide safe nesting sites for the curlew. Pointing out that fencing off an area is simply not enough to protect an endangered species, Judy talked about other habitat requirements such as leaf litter and logs to attract insects, lichens and mosses, sufficient light, and a water source. Judy’s message was clear: it takes time to establish valuable and appropriate habitat, and constant monitoring of fence security is a necessity. Alex introduces participants to the essential tools of the trade. Alex Schipperen provided participants with practical knowledge about fencing materials including type and cost. 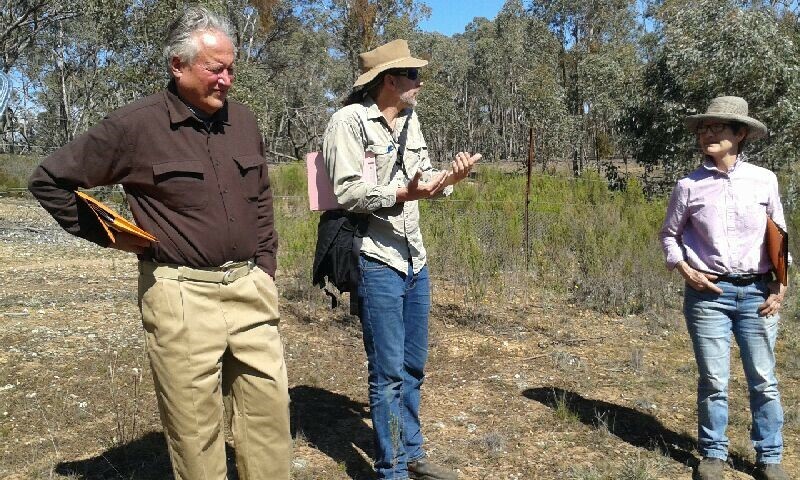 Identifying the main threat to a plot, such as sheep, cattle or macropods will help landholders erect the right style of fence. Alex’s key message was that it is false economy to put in a cheaper, weaker fence when a stronger, sturdier fence will last longer and offer more protection for not much more cost. Provided costings for a number of materials, participants were encouraged to consider their needs for a conservation project whilst being reassured that doubling the size of an exclosure magically doesn’t mean a doubling of cost. 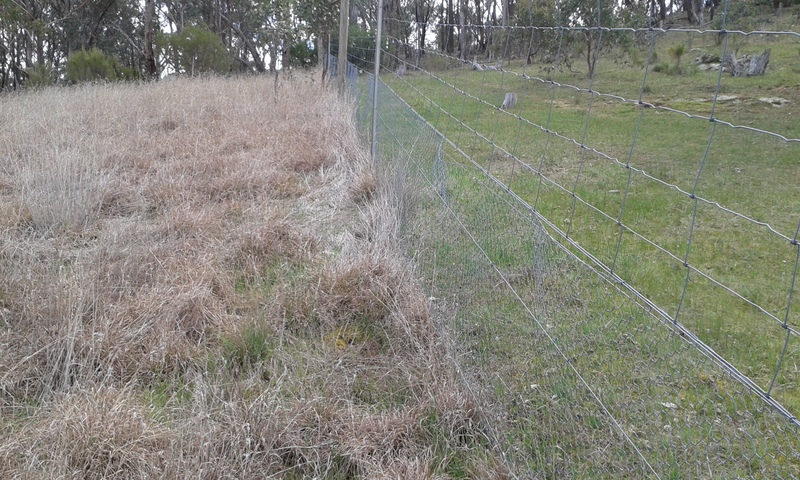 Spacing and type of pickets can be decided by the landholder, and whether to use mesh or wire depending on grazing animal threat. The group observed a number of different styles of fencing on the Higgins plot, including adapting fencing height by adding inverted pickets which was creative but also effective. Alex’s final message was that no fencing can be 100% secure, but careful research and preparation can ensure that the landholders gets the best for their money. An inspiring day thanks to the Higgins and our fabulous presenters.